Rotathene® provides a much higher level of protection against the Sun than the required industry standard for poly tanks. It is referred to as “SUPA UV” for this reason. Rotathene® SUPA UV incorporates advanced additive technology to provide UV protection well in excess of the standards specified. UV protection levels in Rotomoulding grades of PE are assessed under highly controlled conditions of high intensity UV radiation with similar wavelengths to those from the sun. The test temperature is also controlled since, as mentioned earlier, temperature can affect additive consumption and polymer degradation. A number of sets of identical Natural (Un-pigmented) PE samples are prepared and all but one set is placed in a weatherometer test chamber and irradiated with UV over 1000’s of hours. Samples are removed from the UV weatherometer every few 1000 hours and stretched in a tensile tester to determine how much they can still stretch. This provides the % Elongation of the test sample. This value is compared to the value obtained for the set that was not placed in the weatherometer and recorded on a graph as the % Retained Elongation. Because PE becomes brittle as it degrades, its ability to stretch declines and thus the % Retained Elongation decreases as degradation increases. In the Rotomoulding industry, a test sample is deemed to have failed when the Elongation drops to 50% of the value for the original PE sample that was not exposed to UV. The time taken in 1000’s of hours to reach this point is taken as the level of UV protection. For example a PE grade that takes 8000 hours of intense UV radiation to drop to 50% of the value for its original unexposed samples, is said to have a UV8 level of protection. 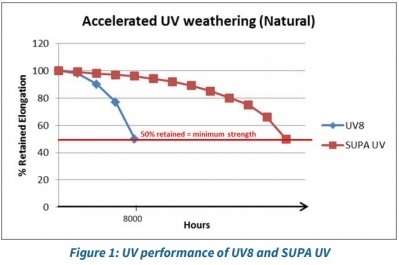 Rotathene® SUPA UV takes longer in the UV weatherometer before it drops to 50% of the elongation value for the unexposed polymer (Figure 1). Testing is carried out on Natural (un-pigmented) PE but additional UV protection is obtained from pigments present in the moulded part. This is due to the ability of the pigments to absorb or scatter UV to a greater or lesser extent, depending on the pigment type, colour and level. Testing of every combination of pigment and level found in the range of colours available to the tank market, is not practical so UV ratings are based on Natural which provides an indication of the minimum level of UV protection. Some work undertaken by a supplier of pigment concentrates (called masterbatches) to the industry did accelerated UV testing on 4 commonly used tank colours and showed that while the Natural Rotathene® SUPA UV PE provided a significantly higher than UV8 level of protection, the pigments which had been melt compounded into the PE base polymer extended the level of protection even more. 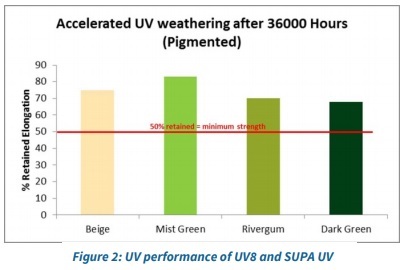 Even after 36000 hours accelerated UV testing, the pigmented samples still retained well over 50% of their original elongation properties (Figure 2). Relating accelerated testing in a controlled environment to what may be experienced in the field is a challenge since conditions in the field vary so much. Just like other polymers, metals and paints, factors such as temperature, precipitation, hours of sunlight, dust, chemicals or salt spray in the air all affect how a Rotomoulded part may behave over time. For many years a UV stabilisation level of UV8 has performed well in the Australian environment so the Rotathene® SUPA UV provided by Matrix Polymers, affords the tank owner an additional level of UV protection in their tanks. All pigments used in Rotathene® Tank Colours are Heavy Metal Free, comply with the requirements of AS/NZS2070 Plastics Materials for Food Contact use and have passed testing to the stringent requirements of AS/NZS4020 Testing of products in contact with Drinking Water. This provides peace of mind to the user that water stored in tanks made from Rotathene® SUPA UV is not affected by these materials and that no heavy metals will be introduced into the environment when tanks are eventually disposed of. Pigments are chemicals which can be quite simple or highly complex in composition and structure. The particular chemical composition and structure provides the pigment not only with its unique colour but also with its weathering and thermal stability properties. Pigments used in Rotomoulding SUPA UV have to have excellent thermal stability since they are exposed to high temperatures for relatively long periods of time during the moulding process. In addition, to ensure they retain their colour as long as possible in the field, only pigments with high weathering properties are selected.